Sad to hear that the Government has decided to appeal the Sharon Shoesmith judgement in the Supreme Court. I think that will be a waste of public money and generally very unhelpful. NO POSTS FROM THIS BLOG IN JUNE. Going to the Arctic for a dose of midnight sun. Back in July. In an article entitled "Child protection work facing recruitment crisis after Baby P tragedy" the Guardian's Patrick Butler reports that many child protection social workers have resigned because of media attacks on the profession in the wake of Baby Peter's death. the results of workforce shortfalls being "catastrophic" for many councils. Sadly he does not provide us with the detailed figures, but there is every reason to believe that this report is accurate. Information from a variety of sources endorses what he says. In this context, I was struck by John Humphrys' interview with Sharon Shoesmith on the BBC's Today programme this morning http://news.bbc.co.uk/today/hi/today/newsid_9499000/9499424.stm. Humphrys said that the nation wanted to know that someone was accepting the blame for Baby Peter's death, because, he said, "... if they do not accept the blame, how can we stop it happening again"? But the opposite may be true. We may only be able to stop it happening again if we do not pursue blame against individuals too far. Not only does the pursuit of individuals give rise to a defensive culture, in which nobody will admit to even an honest mistake, but it creates a climate in which many people simply do not want to do the job, waking up each morning wondering just how long it will be before they become another Sharon Shoesmith. Sidney Dekker is a Swedish academic, who also is an airline pilot. In his role as Professor of Human Factors and Flight Safety at the University of Lund, he investigates safety failures in aviation, medicine and other sectors. In his book Just Culture (Ashgate, Farnham 2007) he argues that not having a just culture in organisations damages safety by obstructing investigations, creating fear and fostering bureaucracy. His book should be read by everyone who works in a safety critical industry, like child protection. If we want people to work safely in child protection - indeed if we want people to work in the profession at all - we need a just culture; and that is precisely what we have NOT got. This judgement sends an important message to all concerned. In the wake of a child protection tragedy the only thing to be gained from pursuing and blaming individuals is short-term publicity and tactical political advantage. It does nothing to improve the safety and welfare of children. Much more important is to focus on the organisational and systematic factors which have created the conditions in which disasters occur and how individuals interact with them. The blame culture not only results in the absurdity of sacking people only to have to compensate them later for not treating them fairly. More importantly, it nurtures a climate in which people are unwilling to admit to failings and errors. As a result failings in practice and procedure go unreported and that makes children less safe. Peter notes Munro's endorsement of early intervention but he seems to assume that this implies that Munro is endorsing the information sharing initiatives of the previous government. Accordingly most of his entry is devoted to talk of removing barriers to information sharing and authorities having "...the right data sharing agreements and technology in place...." It sounds like a response to Every Child Matters rather than to the Munro Review. Every Child Matters promoted the naive idea that simply as a result of having systems which shared more data between different agencies children would be less likely to slip through the net. Nine years on - and countless information sharing initiatives by the last Government - all we have is IT initiatives (like ICS) which continue to be both costly and unsatisfactory and no apparent impact on the safety or welfare of children, except the remorseless undermining of their data protection rights. A careful reading of the Munro Review reveals how far her thinking is from the old paradigms. Children are made safer by contact with professionals who listen to them and take careful, thoughtful action - not by data exchanges! "To say that at the age of 10 you suddenly become responsible as an individual seems to me a bit foolish." But in fact it is contrary to commonsense to presume that children as young as ten have a similar understanding of "serious wrongdoing" to an adult, as Ian McPherson has clearly recognised. We should be ashamed that we treat young people who appear before the courts as if they were invariably as culpable as adults. And we need to remember that the vast majority of children who come before the criminal courts are not charged with serious crimes of violence, but rather with matters such as dishonesty or criminal damage. Our present Government has apparently said that it has no plans to revisit the age of criminal responsibility. It too should be ashamed that it is allowing an issue like this to fester, especially when the Scottish Government has raised the age of criminal responsibility to 12. No-one should take any satisfaction that in England and Wales we have the lowest age of criminal responsibility in Europe. It is a sign of a harsh and intolerant society. 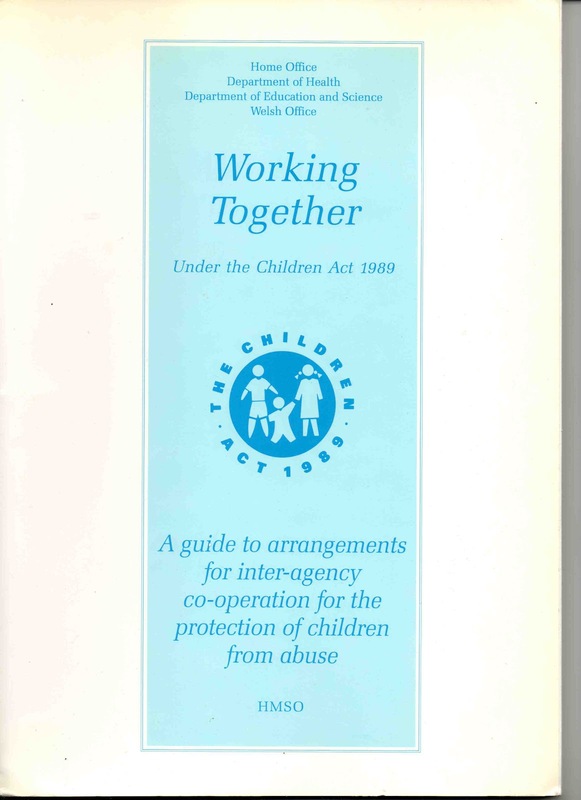 In a post I made in December 2010 I decried the voluminous London Child Protection Procedures, which have now grown into a huge tome over 500 pages in length. The Munro Review report makes similar observations about Working Together, the nationally produced Government guidance on which procedural manuals like the London one are based. Munro observes that one of the reasons for the huge growth in the length of such documents is the conflation of good practice guidance with regulation and statute. This contributes to the de-professionalising of child protection work by eroding the scope for discretion and judgement. A little while ago I made a value-for-money Internet purchase, from a large on-line bookstore (which shall be nameless). 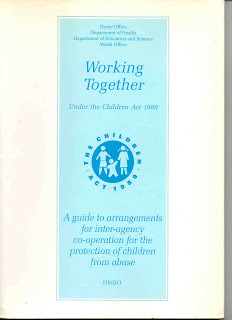 For a couple of pounds – including the postage – I once again became the possessor of the 1991 edition of Working Together, my original copy having disappeared in the mists of time. This slim volume runs (not counting appendices) to only 60 pages of concisely expressed guidance and contrasts starkly with the 2010 edition, which runs to 335 pages (again not counting appendices) – more than five times the length. Successive Governments, aided and abetted by the children’s services ‘establishment’, have presided over this procedural verbosity. Why? Munro points to a risk-averse culture - and presumably the need to be seen to be doing something in the wake of tragedies may also have fostered this approach. I believe, however, that the fundamental flaw stems from a widespread misunderstanding about the nature of child protection services. In my previous post I quoted IT expert, Darrel Ince, as observing that governments have perceived social work "as only slightly more complex than running a call centre”. Put another way there has been a tendency to see child protection not as being a "professional service" but rather as a "service shop" - a bit like retail banking, high street shops or fast food restaurants or call centres. You can write procedures, and use IT to implement them, if what you are managing is a service shop. That's because service shops are relatively simple types of services, where the range of options is fairly limited and 'customisation' to the needs of the end user is relatively straightforward. But it takes only a few minutes reflection to understand that there is nothing simple and straightforward about the complex needs of abused and neglected children. Why the "service-shop fallacy" (as I call it) has persisted so long is difficult to understand. Perhaps the great and the powerful want child protection social work to be a simple process which can be controlled from the centre. Perhaps we all crave certainty is an uncertain world. The truth is that we cannot make difficult things simple by fiat. If we are to have effective child protection services, the only starting point is recognising that they are inevitably complex - too complex to 'proceduralise'. At last an official document has recognised that more guidance and more regulation does not result in improved practice and safer children! 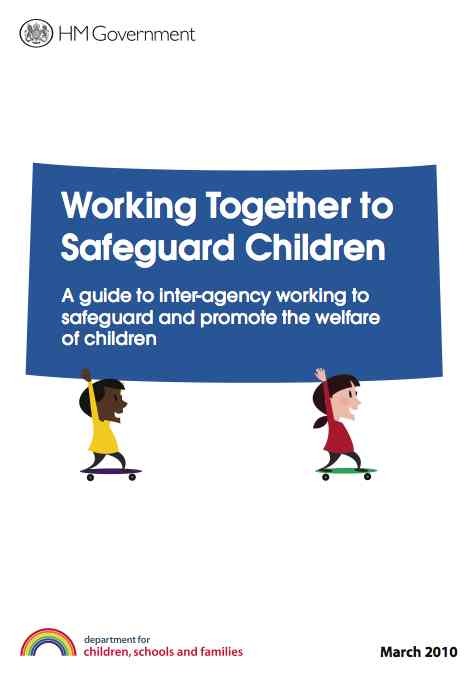 The recommendation also calls for the removal of “… the distinction between initial and core assessments and the associated timescales in respect of these assessments, replacing them with the decisions that are required to be made by qualified social workers when developing an understanding of children’s needs and making and implementing a plan to safeguard and promote their welfare”. Judging by some of the comments in the press, I am not sure that the full implications of this recommendation have sunk in yet. What it means is the wholesale scrapping of the approach that has been developed over many years whereby groups of politicians, civil servants, “experts” and sector leaders have sat down in air conditioned offices and prescribed how child protection social work should be done. A raft of “tools”, “materials” “frameworks”, “exemplars” “procedures” and systems will have to be swept aside. The extent to which people are struggling with this recommendation is well illustrated by two reports I have seen in the press this week. Community Care, in article headlined “Integrated children's systems can be overhauled cheaply” (http://www.communitycare.co.uk/Articles/2011/05/17/116826/integrated-childrens-systems-can-be-overhauled-cheaply.htm) quotes Steve Liddicott, former chair of the national ICS expert panel, as arguing in the wake of Munro that it would be possible to make “quite big changes” to existing IT systems and so avoid the expense of developing new systems. The ability to do this, he says, would depend on the level of in-house IT expertise and on deploying the right skills. But it is not just a matter of ‘overhaul’. In the absence of a comprehensive audit of these IT systems I do not know just how bad or good individual ones are, but I do know that there is a fundamental misconception behind many of them. That is the idea that rather than support practice – as a narrative or chronicling system would’ – many of these ICS systems are built around the nationally designed assessment forms which Munro, quite rightly, is at pains to reject. It would be better to have no computer systems at all than ones that drive practice inappropriately. I think that Steve Liddicott and other apologists for ICS need to become familiar with the work of Darrel Ince, Professor of Computing at the Open University and author of more than 100 research papers and more than 20 books on computing. Darrel Ince obviously knows a thing or two about software. He has also described ICS as having “absolutely no redeeming features whatsoever” (“Computer says: ‘Misery’” Professional Social Work, March 2010). He believes that the short-term solution is what he calls the “barefoot doctor” approach based on devising MS Word templates or using commercial document management systems. These approaches are not likely to be expensive and would allow the development of systems that can cope with unstructured narrative. Most importantly they are not simply modifications, or overhauls, of what Ince refers to as a “forms-based, record-based, database-centred system”. Incidentally, his article contains some great comments. I particularly liked his description of the failure of ICS as resulting from “… government perceiving social work as only slightly more complex than running a call centre”. That comment has wider resonances and might be applied to much of the recent history of child protection social work in the United Kingdom. If there is still a long way to go for some people in understanding the implications of Munro for IT systems, then there is also a steep learning curve for those with wider responsibilities. For example, I was struck by comments in Your Canterbury (not a publication I read very often – http://www.yourcanterbury.co.uk/p_139/Article/a_13673/KCC_child_protection_chief_Cllr_Jenny_Whittle_welcomes_government_reforms ). This quotes Jenny Whittle, Kent County Council’s Cabinet member for specialist children's services as welcoming Munro’s recommendations saying, "It's absolutely right that they (social workers) should be freed up to spend more time developing relationships with vulnerable children and families.” But she goes on to say that she does not agree with scrapping centrally-prescribed timescales for social work assessments, pointing out that Kent is working hard to improve after Ofsted heavily criticised it for poor timescale management. “If you don't have timescales, “ says Jenny Whittle, “then you risk losing discipline. If that is one of the plans adopted by the Government, we would seek to keep timescales in Kent." Sadly, Jenny, you can’t have it both ways. You can’t "free-up" social workers time if you are prescribing how they will spend it. You can’t square circles. It seems that the most difficult thing about the Munro Review may be the creation of the conditions in which it can be implemented. People will naturally adhere to the familiar. After years of central control and imposed systems, it will be difficult for many to think outside the box. Let's hope that the government moves swiftly to endorse the overall approach and begin the process of change. Back in October 2010 I made a long post about 'Lean" - the idea that successful operations are those that strictly focus on those activities which 'add value' and abhor waste. How typical, I wonder, are these sources of waste in child protection work and how much more effective would services be if they could be severely reduced or eliminated? Following my two previous posts, just a thought. Why doesn't some-one (e.g. Ofsted, the Department for Education, the LGA) collect some basic data about recruitment and retention of children's social workers - and publish it? The Local Government Workforce Survey - published by the LGA - doesn't really provide the kind of detail required. I'd suggest the following: vacancy rate, turnover, average time in post of current staff, reasons for leaving, proportion of agency workers, proportion of newly qualified staff in post, proportion of staff recruited abroad. All of that must be available in the HR systems of local authorities and could easily be sent to a central point for collation. Having that sort of data would not only give a clear national picture, but would allow the identification of areas where the problems were most severe. There were parts of the first episode of BBC Radio 4’s Who'd be a Social Worker that I found puzzling [http://www.bbc.co.uk/programmes/b010gj9k]. For example some of the social work students’ comments on their practice placements ranged from the odd to the bizarre. A couple of students appeared to have been sent off to handle child protection work on their own, with one claiming to have removed children from their parents on two separate occasions, with only a support worker in tow. In contrast two students had had placements with little social work involvement – “filing, faxing and photocopying” and “making breakfasts for service users”. Then there was the odd case of the student who had failed her placement for rolling a cigarette…. The programme seemed to be on firmer ground when it was a matter of facts and figures. We were told that Birmingham University had no shortage of applicants for the 64 places on its social work degree course – 1000 in fact. And as the programme progressed it became obvious that the problems of staffing afflicting child protection social work stem not from lack of recruits but from lack of experienced staff. A recruitment agency manager said that most of the jobs on her books were marked as being not suitable for newly qualified social workers and that it was very hard to place those with no post qualification experience. On the other hand experienced social workers – of whom there were very few – were like ‘gold-dust’. And then there were those who had qualified and found work but did not want to stay. One disillusioned recruit complained of ‘so much paperwork’ and ‘so much working on the computer’. She described her job as ‘tedious’ and said she only had contact with service users occasionally. I suppose none of this is much different from what we already know. There is a real problem of retaining experienced and qualified staff in children’s social work and the problem does not seem to be getting the attention it deserves. Clearly creating a surplus of newly qualified social workers is no solution. Having a few advertising campaigns to drum up interest in social work degrees is, of course, relatively easy. What is much less easy is creating the kinds of conditions within employing agencies which will make qualified people want to stay and develop a long-term commitment.